I've officially decided to add a whole page 4 the Jonas Brothers(AKA the JoBros) If ur a JoBro fan(And i could name a couple), go ahead, enjoy this awesome page(I know i will :D), starting with the "Burnin' Up" Music Video (I'll add more stuff soon)!!!! 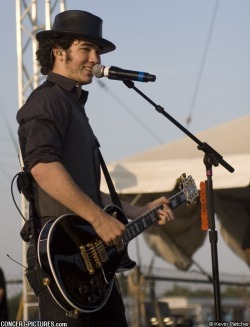 My Opinion: He's the most talented jonas brother and my favorite! My Opinion: He needs SO MUCH MORE credit! he's an awesome guitar player!!! My 2nd favorite jonas brother! Ha!!! U thought i was actually gonna 4get The Bonus Jonas? There's no WAY i could've!!! I couldn't find as much info on him, but here! Jonas Brother: The Bonus Jonas!!!! My Opinion: What's not 2 like? My Same Friend's Opinion: He's SUPER CUTE!!!! Extra Info: He has his own band called "Webline" which he's hoping his brothers will open soon. Yes, this is the end of this page. I'm sorry. But, it could be WAY longer if u gave me some ideas about what i should put on this page besides what i already have! Please give me more info on the JoBros!!! Thnx!! !